I thoroughly enjoyed Rachel's writing. 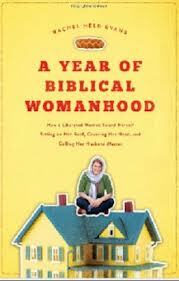 With humor, sincerity, and determination, she parted the waters of what it means to be a woman and a believer. I did not agree with every interpretation, but I appreciated the wisdom she gleaned from her studies and attempts at living out the scriptural laws of the Old Testament. Supported by her husband, Rachel delved into Proverbs 31, the life of a woman in biblical times, women's lives that echoed the respect that Jesus gave them and the great responsibility they held for their families and the church. A good book for a women's book club.